You can set all the details to the maximum level inside the game and just play with the Post Process Quality option, because it’s two options produce quite different results in terms of graphic detail in the game. Try it out and see which one do you like better, personally I’m Ok with both… although the Simple setting provides clearer looking objects in the background (far away trees for instance). Of course you can play with these as you see fitting depending on your personal preferences and your system’s capabilities… on GeForce GTX 275 the game works at max detail level with more than enough FPS. 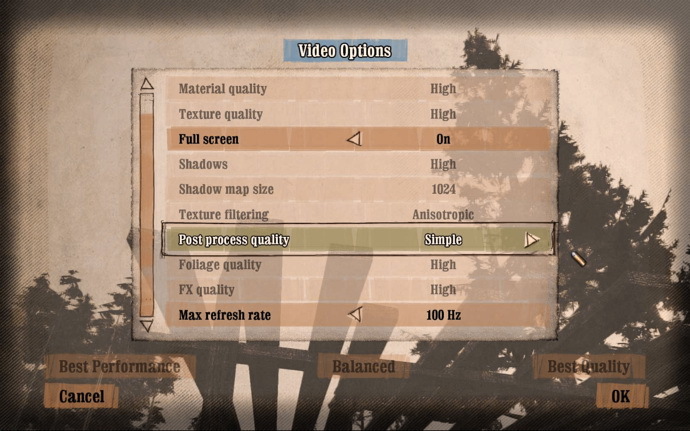 The key moment in achieving astonishing results with Call of Juarez: Bound in Blood is setting up the right convergence level in order to achieve both a great pop-out of the screen effect and good level of depth. 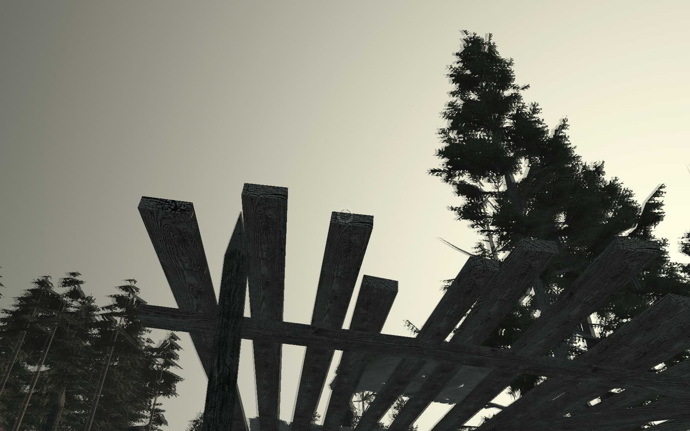 Just right after you start the game in some trench in the middle of a war you need to go to your left to the wooden shelter-like thing and stand right in front of it, then look at the roof like in the picture above and start adjusting convergence level (hitting CTRL will set your character in crouch position, but don’t worry). Now, what you need to do is set the convergence level so that the closest part of the roof is not doubled (you can take of the 3D Vision glasses to make it easier), but is just a single image with and without the glasses. The far parts of the roof and the trees in the background should have a shadow when looking without the glasses again like in the screenshot above, the important part is setting the no-double look of the front part of the roof. This should give you the best results in the game both in terms of pop-out of the screen and depth perception and will definitely change the first opinion you’ve had running the game with 3D Vision. I’m also providing two Reg files that you can directly import in your computer, they contain only the custom convergence settings I’ve created and am using with Call of Juarez: Bound in Blood. They are from Windows Vista 32-bit and Windows 7 64-bit machines, but you should be able to use them in on both OSes if you maintain the 32 and 64 bit separation. Please feel free to report if they work for you or not, but even if they don’t work out on your PC you can always achieve the same result following the guide I’ve from above. It still looks unplayably bad. The thing is that both eyes see different shadows. Can’t look at it for longer than 30 seconds. Have you tried setting up Post Process Quality to simple, it is much easier on the eyes this way, at least for me? Yes tried it, but it was still impossible to look at. Great game, but a little bit short. All in all, good story, good gameplay and a lot of fun!